Do you notice that something seems to go wrong at the worst possible time? When it comes to your lawn water sprinkler, a clogged sprinkler head or a buzzing pump are issues you need to resolve right away. 1. Broken spray heads: If you notice that your sprinkler heads don’t pop up or they pop up only to spray water everywhere, you may have a broken spray head. Broken spray heads occur when lawn mowers or other vehicles drive over them. To fix a broken spray head, find the correct sprinkler head to match your irrigation head. 2. Clogged sprinkler heads: You may have a clogged sprinkler head if the head doesn’t rise and there is no water. Dirt, sand and other debris build up in the sprinkler head filters. To clean a filter: Turn off your water, lift the pop up riser, remove the nozzle and the filter, clean the filter and return to the nozzle. 3. 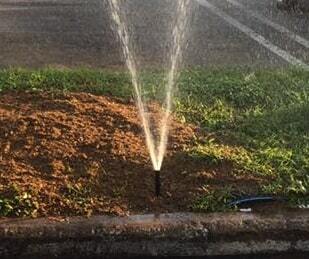 The water sprinkler controller stops working: Here are four main problems that could cause your controller to stop working: it fails to keep time, your timer dial may not be turning, your controller won’t turn in the manual mode, or the controller fails to operate in the auto mode. For these four different problems, we provide four different solutions. Check out our FAQs for specified tips to fix your controller problem. If the valve is not installed at the highest point of the system, there may be backflow entering the valve after shut down. If backflow enters the valve, it will cause the disc to skip as it is pushed against the backflow. The result: water will come in through the inlet during start up. Install a check valve on any outlet that has zone piping higher than the valve. If the pump is located more than a few feet from the water source, the inside valve disc pops up and down, skipping zones as the supply line fills with purging air. To fix this problem, move the indexing valve closer to the water source, so that the electric control valve or pump is closer to the indexing valve to pressurize the supply line. If you have a pump fed system, there may be suction leaks on the pump intake line causing the pump to surge or not keep a steady flow of water for the disc of the valve to depress and stay in one zone. You’ll need to contact a contractor to diagnose, locate and repair the suction leak. 6. There is a chattering noise after you installed the pump: The pump start relay may be too far away from the controller, and the wire size between the controller and the relay’s coil is too small. To stop the chattering, change the wire size to 14 gauge for runs over 15 feet. If your controller’s transformer is too small to pull the relay contacts in, you need a bigger transformer to stop the problem. Contact a contractor in your area to diagnose the problem and to fix it for you. 7. A usually quiet pump starts buzzing while in operation: When the pump starts buzzing, it means the relay is on the fritz, and it needs to be replaced. Since the relay is a magnetically activated switch, its contact points start to oxidize, making it ineffective at pulling together the high voltage contacts. The result is a buzzing sound. High moisture or high salt climates will accelerate this process resulting in shorter service life.